There has been interest about my life growing up at the cabin and how it influenced my first book. Because of this, I decided to do a series of posts talking about my time at the cabin, and how I experienced it through three different phases of my life, childhood, teenage years, and adulthood. I hope you enjoy these! My first memories of the cabin are pretty vague, as you can imagine. My family only spent the summers there, arriving at the beginning of June and staying until late August. It is the major events that stick out to me, but there are several other elements that are more feelings than specific things. Like the memory of comfort in general, rather than remembering the specific thing that gave me comfort. But let’s start from the beginning. Before I even begin talking about how it was to spend time at the cabin each year, I wanted to talk about the actual drive to the cabin itself. The road trip. This is probably the most boring element of the story, but it was such a large part of each vacation that it is ingrained in my memories as much as any other piece of cabin life. So off we go! The preparations for vacation began. As the school year wrapped up, not only for me and my siblings, but also for my parents who were both high school teachers, anticipation would start to grow for the upcoming trip. I knew I would be saying goodbye to my friends, which was always disappointing. My best friend would come running over from his house a few block away to wish me a good summer and let me know he’ll miss me. I find it odd that I don’t have strong memories of those goodbyes. I can only guess that the excitement for the joy that awaited me in the woods outweighed it, and I couldn’t wait to get back to the lake and the lazy days of summer. Packing the suitcases and then loading the car was always a huge process. After all, we were preparing to spend almost three months away from home. My family had one of those classic Ford Country Squire station wagons. You know, the kind with the fake wood paneling on the sides. For a family with two, three, and eventually four children, three months of luggage and supplies, and a dog, the space was needed. My father would be the one to do the actual loading of the car, placing each item in the wagon in a pre-planned way, like fitting puzzle pieces into their proper slots. He always left plenty of space for the kids to move around, which was appreciated. My siblings and I would haul out each bag from the house, depositing them on the sidewalk next to the car and running back inside for the next ones. About an hour before leaving, the dog would get half of a tranquilizer pill that my father had gotten from the vet. By the time the trip started, she would be calm and eventually sleep through a good chunk of it. Finally, we all climbed into the car, riding dangerously low on its shock absorbers, and set out on the first stage of our summer vacation. The first hours passing by. The drive was from California to Idaho and the trip was twelve hours long, so my parents prepared for the kids to be bored and annoying. I remember we always had a grocery bag in the front seat of the car, filled with snacks and drinks. Mom would dole out apples, crackers and cheese in a can, and Oreos if we were good. The drinks, of course, led to bathroom breaks, and not always where there was a rest stop. Out on a lonely stretch of highway through Nevada, after much complaining, my father would pull the station wagon over onto the shoulder. My brother and I would pile out of the car and run off into the scrub brush, dodging past old tumbleweeds, looking for the most secluded spot in that vast, open land. To hurry us up, the words of my mother would follow us out the window. “Watch out for the ‘bottom biting bush bouncers!’” At five or six-years-old, that was scary enough during the day. But if circumstances had led to my family getting a later start in the day on the road trip, and if now it was nighttime, with only the shining stars and the ambient glow from the headlights providing any light? At those times, there was a true fear of getting your bottom bit, and we did our business faster than you could blink! Once we had settled into the drive, my mom would pull out a book and begin to read to the family. The works of J.R.R. Tolkien, were a common go-to. The stories of the hobbits and their journeys would always be thrilling, and we would listen with rapt attention. The cities of California flowed past and before you knew it, we would be making our first of several gas stops in Reno, Nevada. Landmarks on the trip were always special occasions, and we would usually stop and get out of the car to stretch our legs. The salt flats just outside of Reno and the sand dunes shortly after Winnemucca. And my favorite, Breadloaf Rock on the hills just before entering Horseshoe Bend in Idaho. 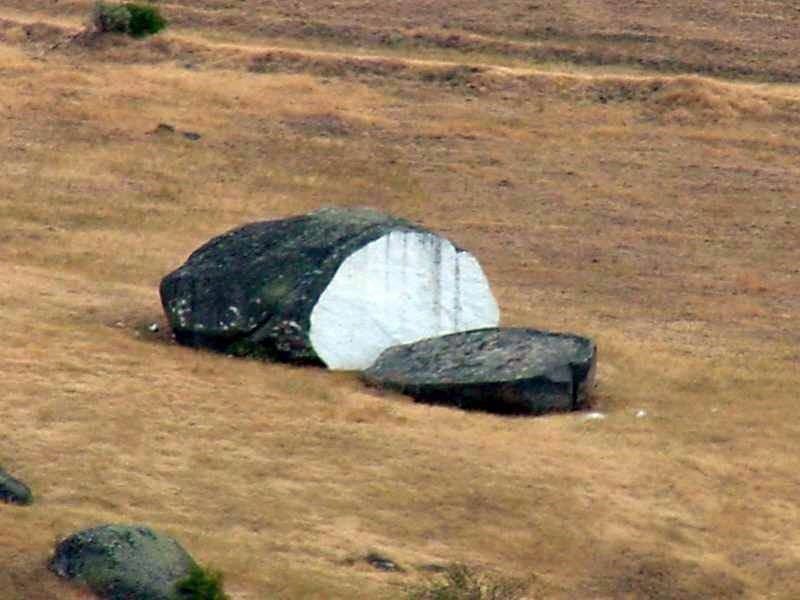 It was a giant rock in the shape of a loaf of bread, even featuring a chunk on the end that looked like someone had used a massive knife to cut a slice and leave it laying there. These all reside vividly in my memories. Staring out the windows and watching the empty spaces between pass by had a lulling effect. As the afternoon dwindled into evening, sleepiness would settle in. Now, this was before the time of required safety belt use, so I would climb over the back seat into what we called “the way back”. I’m still not sure if that was the official name of that space behind the backseats of a station wagon. But I know that it was the best place to sleep. My father had this worn, brown leather suitcase, and the surface was incredibly soft. I would curl up on top of that case, feeling the vibrations of the car and listening to the hum of the tires on asphalt. Years later, the band REM released the excellent album Green. There is a passage from the song You Are the Everything on that album that perfectly describes those moments. Depending on when we left our house, my parents would either drive straight through, and I would get to sleep through the night, only awaking when we arrived in Boise, Idaho with just a couple hours left before reaching the cabin. Or they would choose to stop at the halfway point of the journey, Winnemucca, Nevada. Winnemucca is an interesting city, and even to this day I get a great feeling rolling into town. They are famous for their rodeo, and The Griddle is a great place for breakfast! Back then, Scott Shady Court hotel was our destination. Tucked a couple block off the main street, the rooms were small, clean, and cheap, and the manager would pin the room keys to the small corkboard hanging just outside the office for those guests arriving after midnight. I clearly remember the smell of cleaners and stale air from the lingering smoke smell of previous guests. And the beds with the coin-activated vibrators. As an adult, I can’t imagine what purpose that served, but as a child I found it endlessly entertaining. The bed covers and sheets were rough and stiff, but I didn’t care. After stopping there for so many summers, the place was familiar. There was a small grassy play area with those rocking horses with large springy bases that wobbled. They even had an indoor pool, but I don’t think we ever used it. The color of the water was never quite right. The miles passed, as did the landmarks and the cities, some as big as Sacramento and Reno, some as small as Jordan Valley and Rome, Oregon, which the sign said had a population of 173, but I’d guess it was closer to 99. When we finally hit Cascade, the last gas stop before the cabin, and grocery store shopping for perishables like milk and eggs, we all knew the long journey was almost over. Making that turn just outside the city, we would finally leave the highway and ascend into the mountains. This last stretch was only 26 miles or so, but the road was winding, so my father drove more slowly. The car windows would get rolled down as we entered the forest proper, and the scent of fresh pine would drift into the car, clean and glorious. Even the dog would perk up, sensing the anticipation flowing from all of us. Finally pulling up to the cabin, my grandparents who had arrived a few weeks before us would step out onto the front patio to greet us. Car doors would get flung open, the family quickly abandoning the car that had kept us prisoner for the past 12 hours. After a quick hug for my grandparents, I would fly down the hill, following the short trail to the dock and the lake below, my mom’s voice calling after me, “Don’t go in the water!” After reaching the bottom of the hill, I would step out onto that dock, take a deep breath and look in all directions across the calm surface of the lake, my mind going wild with imaginings of what adventures I could get up to this year. Thank you for reading this introduction to my summers at the lake. I hope you enjoyed it, and if you have ever been on road trips of your own, I hope you could relate. Stay tuned for the next blog post, in which I will talk about my childhood years and the adventures and accidents of being a free-range child in the forest. Please feel free to leave comments or ask questions. They are all welcomed. I absolutely love the memories of our annual trips to the lake. The cabin, the lake, and the forest are central to who I am and what I have become in my values and appreciation of the wonderful world we live in. Thank you! This series was an incredible trip down memory lane for me, bringing up memories I had forgotten and rediscovered, giving me a new appreciation of the cabin.